Come to Teachers College, Columbia University this Sunday for an afternoon of celebration, taiko and fun! 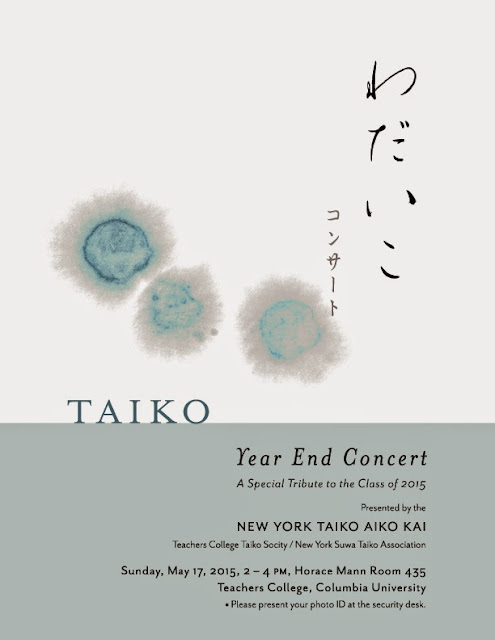 This concert is a Special Tribute to the Class of 2015, and a chance to share Taiko with you. Currently open only to friends and family members, please send us an email at nytaiko (at) gmail.com if you are coming. *Please present your photo ID at the security desk. There will be a workshop session at the end where everyone can try out at our drums. Thanks as always for your support!